Kelley Acres Cyclocross took place October 4, 2009, in Middletown, Maryland. 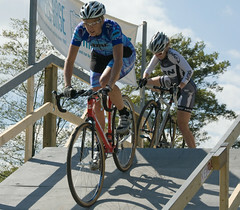 The event marked the second day of a double race weekend for the MABRA Cyclocross Series. Racers were greeted with an entertaining course that rewarded climbing ability and nerves of steel. A long climb, fast swoopy descent and Euro-style flyover made for a great day of racing and spectating. The Kelley Acres Women's Elite Podium. Photo by Marni Harker. The women’s elite field featured one of the best races of the day. Three women established a group early and stayed together for most of the race before Jennifer Maxwell (ATAC Sportswear p/b The Bike Rack) powered away for the win. 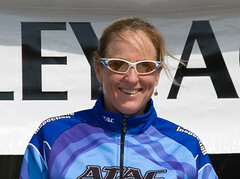 Close on her heels were Julie Kuliecza (Alan North America Cycling) and Lenore Pipes (unattached). We caught up with this trio to get their thoughts on the race and the course. After racing the Breast Cancer Awareness CX Challenge on Saturday, did you choose any different gear for Kelley Acres? Did you change your warm-up routine at all? Any easy spinning or other riding post-race on Saturday? Jennifer Maxwell (1st Place, ATAC Sportswear p/b The Bike Rack): I used the same Challenge clincher in front and the Dugast Tubular in the rear. I also used more air on Sunday because I felt I was bottoming out (more than usual) on Saturday at BCA. I was able to warm up more on the course since they allowed more time at KAC than at BCA. I really like the KAC course and decided to just spin on the trainer for a half an hour instead of the usual 45min to 1hr. Julie Kuliecza (2nd Place, Alan North America Cycling): On Saturday after BCA I cooled down by riding around a little – for me this really helps my legs out. Over the last couple of weeks I have decided to change my warm-up routine. I think I was going too hard before. Now I make sure I ride the course multiple times two hours prior to my race, relax a little get dressed, stretch get on the trainer maybe 45 minutes before the race and ride moderately, maybe I will put a couple of good efforts in, but nothing more than a three to five minute effort. I am still trying to fully figure out what I need to do before cross races to be prepared. Lenore Pipes (3rd Place, Unattached): The wheels that I used at BCA were the Revolution Wheelworks Rev-50s from Echappe Equipment. They were awesome on that course and the front one was awesome at this course. I punctured a tubular on the last lap at BCA and I am very thankful that Stu Louder from ALAN let me borrow a rear wheel for today. I couldn’t have raced without it. I don’t have a team right now so I am just wearing whatever plain jerseys that are clean. Maxwell and Kuliecza descend the flyover. Photo by Marni Harker. Jennifer Maxwell: Initially, I thought the long back climb would be my nemesis but I have been doing longer interval workout and it was actually my favourite part of the course. I was able to get a good rhythm and keep my speed throughout the entire climb. Well ,I loved the flyover. It was such a treat to have a flyover at a local race. The more I can practice on a flyover the better it will prepare me for the UCI races with flyovers. Also, I like the first grass section with the natural barrier. I was able to power through the turns and get out of the saddle on the flatter sections. Julie Kuliecza: Hmm—I was really digging on the short uphill to the smaller descent. I also really enjoyed all of the corners I felt like I could flow through them. I could have done without the long descent—not because I didn’t like it, but because Jen was taking it a lot faster than I was!!! Lenore Pipes: My favorite part of the course was the flyover. The photographers took some extremely flattering pics of everybody under that thing. I thought the second set of barriers was too close to the flyover to be worth it to try hopping. But, that is just me, Jeremiah Bishop didn’t seem to have a problem with that at all. How did you approach the fast descent into the sweeping left-hander on the backside of the course? It was fast and slippery in the morning and then seemed to dry out some. Where did you brake? Did you dab? Share your technique. Lenore Pipes: That was the toughest part of the course for me. I tried to follow Jen Maxwell through that but she was just too smooth for me. Jennifer Maxwell: I was going much faster than I normally do when negotiating a downhill. I felt safe with my choice of tires and air pressure. It was fast and I did not slip that much. I was able to actually take a quick breath and recover for the next section. Kuliecza in pursuit of the leader. Photo by Jim Wilson. Julie Kuliecza: By the time we got on the course the descent was dry. I came down on the right side of the hill with a little too much tappity-tap-tap all the way down. My brakes were squealing in pain!!! The only part I think I was okay on was letting myself go toward the end of it and taking my turn all the way to the tape. Jennifer Maxwell: Loved it. I especially liked that it was on a slight downhill because it allowed me to shoulder my bike before the natural barrier and maintain momentum up the stairs. It was safe and great to ride under at a fast speed. Julie Kuliecza: Flyover=fun. I liked that right after you went down the flyover you took an uphill corner. It was logistically laid out pretty nice on the course. Wish I could have doubled stepped the stairs like Lenore and Jen—I blame my short legs. Lenore Pipes: It was a great height. Not too steep but steep enough, and the landing was just long enough to be able to remount without being afraid of hurting yourself. Pipes was in the hunt all day. Photo by Jim Wilson. Lenore Pipes: I rode the first set of logs and dismounted on the second set. I am mainly a road racer so I don’t usually encounter these but I just tried it. It wasn’t graceful but it seemed to work. Jennifer Maxwell: Dismounted. I found it faster to get back on the bike, maintain my momentum, and power through the turn out in the saddle. Julie Kuliecza: I dismounted on all of the log barriers. I felt like the most I could lose was maybe two seconds on each dismount. I didn’t want to risk slamming my back wheel onto the log. At the flyover the ground after the logs seemed really bumpy and when I was watching other races everybody that hopped it slowed down much more after the logs because of the bumps. I also made sure that when Lenore and I were together at the logs (which she bunny hopped every time) that I was in front of her the last two laps and dismounted where she was hopping them so I could keep her at my pace. Maxwell enjoying the podium's top step. Photo by Marni Harker. Jennifer Maxwell: With a few laps to go I saw Lenore Pipes take the first grass section and barrier cautiously, so I powered ahead of her and decided to put the pressure on through the corners and jump out of the saddle on the flats. After that I put in a big effort up the small hill after the flyover and was able to get a gap and thereafter I tried to maintain my rhythm throughout the remaining laps. Julie Kuliecza: Hmm … well, Jen was taking the corners faster than the two of us. Lenore was in front of me and Jen got a gap which she opened up on the downhill. We couldn’t catch back on after that. Between Lenore and me, I made sure I was in front of Lenore for the last lap of the race so I could gap her in corners and make her work just a little bit more. She is so strong that I figured that was the only way I could beat her. Fortunately my plan worked. Lenore Pipes: The start was crucial. Jen, Julie, and I got a gap pretty early. I tried to push it more on the climbs but in the end Jen pwned us on that technical downhill. Julie Kuliecza: Recovery drink, apple, veggie burger, cookies. Jennifer Maxwell: A crab cake and MD crab soup & H20. Lenore Pipes: I took a recovery drink right after the race. Jennifer Maxwell: Chris & Fred Kelley and the Kenda girls who cheered me on. Julie Kuliecza: Lenore, Jen—you are great to race with. ALAN, Altius, and all Richmond CX peeps—you are the best cheering squad ever. Sally and Chris of Stellina—thanks for the best bike EVER!!! Lenore Pipes: I would like to say thank you to Gabe Lloyd of Echappe Equipment for helping me out with a sick wheelset this season. I would like to thank Chris Kelley for letting us have a really rad time on her property. I would like to thank all the volunteers, sponsors, and the promoter … without you guys we wouldn’t be able to race cross. Thank you Joe Jefferson for always giving me a shout out, and thanks to Lance Lacy and Heidi Goldberg for the podium kisses.